Not to echo CNN, Fox and MSNBC, but Paris Hilton was released from jail only 3 days into her 23-day term. Also, 4 years ago, we invaded a country because our President and Vice President said it had weapons of mass destruction AND a link to Al-Qaeda, and it turned out, it had neither. Technically, Hilton was released for what is being termed “medical reasons”, however her symptoms are most likely less severe than those suffered by soldiers in Iraq, many of whom are injured by IED’s. IED’s are “improvised explosive devices” and are often place alongside roads where they will go off and injure American soldiers. Most likely placing these IED’s are sectarian groups made up of, or using weapons from, the former Iraqi army, which was disbanded by L. Paul Bremer, when he headed the Coalition Provisional Authority in the days after the war. This move effectively put on the street, a bunch of armed men, all of whom were, basically, just fired. A huge number of these IED’s were effective because the Humvees soldiers were provided with, lacked the armor needed to withstand the blast. 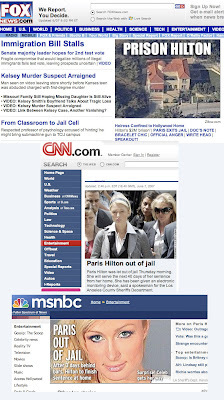 Currently, the three major news channels are awash with outrage…over Hilton’s release. Authorities have promised a prompt investigation into it, and in response to public outcry, have already scheduled a hearing on the matter, to which Hilton will have to, whether she likes it or not, phone into. Attractive people get better treatment. That's it. Anyone who has a problem with that is ugly. Thats what your popularity gets you. Not even 3 days in jail and out now despite of 23 day term. Justice should be equal for all type of people. Rich or poor.